In addition to fun and exciting games of table football, hockey, tennis, and so on, you can also relax a little and play a few quest-based board games. All of them have a magnetic base, which makes the game more comfortable. You will have to find a place to store all of the numerous accessories. With this amazing gaming table, you, your family, and your friends will have an opportunity to choose from one of 34 games to entertain you. 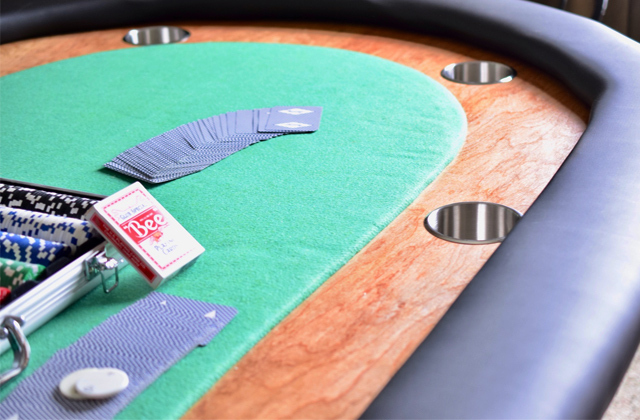 The table itself is comprised of only the highest quality materials and the board games will prove to be challenging enough to have some fun along the way. All gaming tables are compactly assembled when not in use. The kit includes a number of accessories for playing billiards, darts, hockey, etc. Also, there are 14 magnetic board games. This soccer table is equipped with a vertical folding system which makes it very compact (65 x 61 x 156 cm) in terms of storage, which is an underrated element if you don't really have too much free room in your flat. The bottom metal rail may interfere with one of the players. 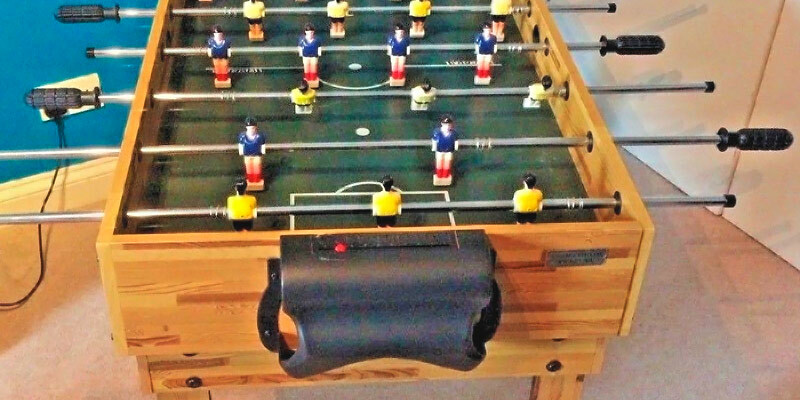 Using this amazing toy, you will be able to quickly hone your foosball skills. And only the fair play will be able to determine the champion. There are no sharp corners on this table, so children will not hurt themselves. The package includes three additional foosball balls, which will prove to be remarkably useful when you inevitably lose such a small accessory but would like to continue playing the game without wasting a huge amount of time searching for the ball. The instructions are not that informative. This stable and durable football table is fitted with mechanical counters, comfortable ergonomic handles, and the non-slip feet to prevent the model from slipping and damaging the floor. This product comes with all the necessary tools for assembling. However, you can use your own electric power tools to put the table together in no time. 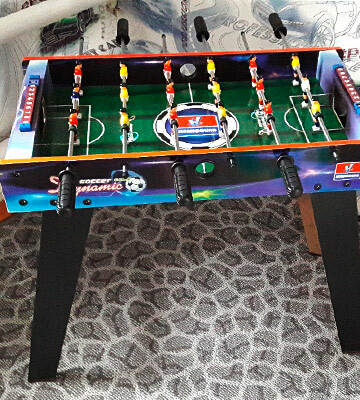 This table has a bright design with detailed football players figures, a realistic green field with markings, and the football balls which look exactly like the original. Because of comparatively low weight, the table may get unstable during intense matches. This bright table for children will make your kids adore world-class sports. The assembly will take you only about half an hour. Besides, you can always unscrew the legs for more compact storage conditions. The Table Top model is rather light in weight, so you can take with you to a picnic or visit your friends with no problems. Also, you can put it on a low coffee table and allow the smallest players to enjoy the game. You may find the assembling part somewhat difficult. It is an excellent table football for children. Thanks to the grooved non-slip handles on the bars, it doesn't take an expert to control the players. The ball rollout is located on the player's side, so you shouldn't have any problems getting the ball. Table football, pool, glide hockey, chess, knock hockey, checkers, shuffleboard, skittles, ring toss, playing cards, tic-tac-toe (noughts and crosses), table tennis, magnetic darts, dominoes, horseshoe, pickup sticks, poker dice, magnetic American football, marbles, and backgammon - you get all of these by purchasing the Mightymast Leisure 34-In-1 Multiplay Games Table. Moreover, the manufacturer includes 14 additional magnetic board games: ludo, goose game, manji, game everywhere, steeplechase game, snakes and ladders, space-venture, route chess, Chinese chequers, train chess game, racing game, motor racing, baseball game, and dice rotate table. Talking about the design, this oak foosball table from the Mightymast Leisure company was undoubtedly made to last and bring great joy to all your family for many years. The sturdy cabinet with stable non-slip legs will not only serve you for ages but also won't damage the floor during some of the more intense matches. And thanks to the light oak wood finish, the table will be suitable for any interior design. It should be mentioned that, when not needed, you can pack all this stuff into the table. This model can be rightfully called a versatile toy for all family members: both adults and children can develop their skills in various games and learn quite a few new ones. And, more importantly, the price is rather reasonable. The Riley football table is an excellent entertainment source for adults and children during family and friends gatherings. Also, it can be a wonderful gift. The game comes in bright packaging and has a stylish design. 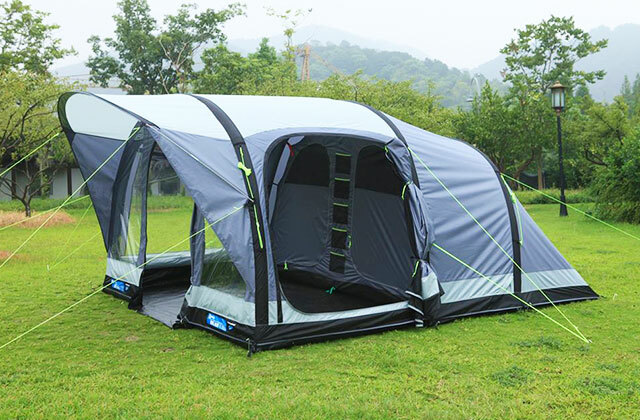 It is made of modern durable materials that guarantee a long service life. 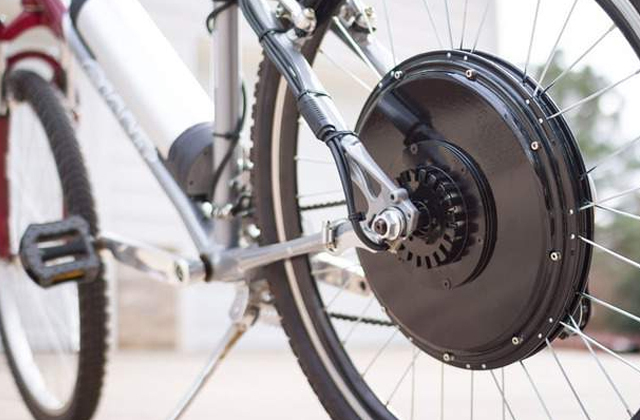 The model is incredibly convenient and does not require special storage conditions. There are two teams on the blue field: one in blue and the other one in red. Who will win? It's up to you. Everything will depend solely on your skills. 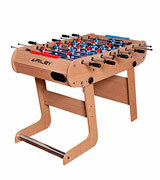 This football table comes fitted with convenient ergonomic handles and legs with non-slip feet. Due to the vertical folding legacy system, you can fold the table for compact storage. 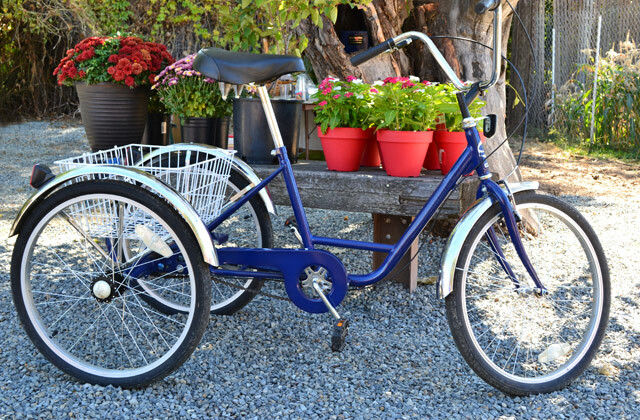 The rod handles are made of plastic and have a comfortable shape so that both kids and grownups can hold them with ease. Figures of players are made of brightly coloured polypropylene (hard and durable plastic). Chrome rods can rotate 360 degrees and move on the field along its width. 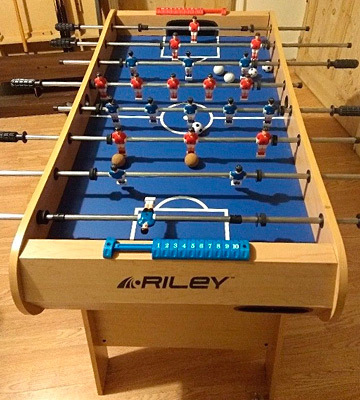 The Riley table football is a carefully designed game. All the details are taken into account, so players can feel comfortable using it. The ball rolls into a special recess, where you can easily get it and continue playing without wasting any time. To count the goals scored, there are special scorers behind the gate. Looking for a mobile yet usable table for playing football, you should definitely consider this model. The Riley Men's Azteca 4 'Folding Football Table is a great purchase for active children, football fans, those who want to learn, and, of course, for people who are crazy about competing. We would like to present the JumpStar Sports Classic Football Table which will allow you to experience the most exciting games of your life. The JumpStar Sports is a reliable enterprise with qualified personnel that are responsible for manufacturing sports equipment both for professional and for personal use. The JumpStar Sports Classic Football Table is a full-size model, meaning that it will be great not only for having fun but also for tournaments at a relatively professional level. Here, you will find blue and red teams playing against each other. There's no doubt you will be crazy about these classic derby games. As for the design of this soccer table, the ergonomic handles are cast from an elastic plastic. Thanks to that, a handle comfortably sits in hand and does not slip. Solid and reliable figures are made taking into account the fastener's constructive features. The impact part of a figure is there for improved ball control and has the sufficient side surface area for dribbling along the line and for passes; the front part is there for holding and hitting, and the rear has the right angle for pressing the ball to the field. Also, the table includes non-slip feet for stability and, as the majority of tables for football in its class, this one comes with the counters for tracking every goal. Table football takes by storm children and adults, women and men. Having such a game table at your immediate disposal, you will always have a consistent source of entertainment. 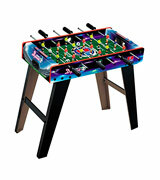 The Jump Star Classic 4ft Football Table is ideal for both commercial and home use. 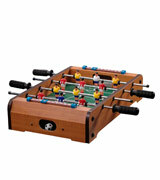 The Guaranteed4Less Wooden kids' foosball table on the legs develops the children`s motor skills. Playing table football can be really positive in terms of overall development: it enhances attention, imagination, motor activity, sense of vision, coordination of movements, and observation. 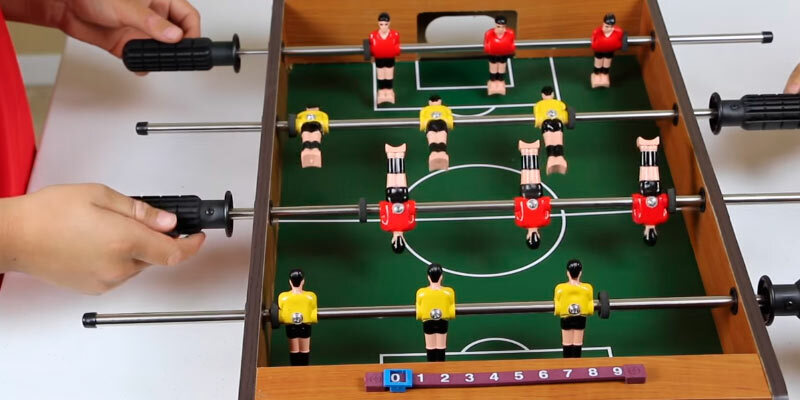 This table football boasts carefully elaborated details that add some realism. The field size is large enough and the location of eighteen players will make the game feel more real. Your small champions will be full of excitement and competitive instincts. Thanks to the design, the child will be comfortable playing this fascinating game. This game will definitely enthral your small football fan and the child will feel like a real football player in his own football team. This model is made of wood, so, with its stylish and versatile appearance, it will serve as a decoration for any room. However, if you do not need it too often, you can just remove the legs and place the toy in your hall closet, for example. This game is marketed as a device for children, but, undoubtedly, this is a toy for the whole family, and you and your little ones will get into the game in the blink of an eye. So, go ahead and arrange competitions for the World Cup with this football gaming table. And do not forget to prepare an award for your little Stuart Pearce. 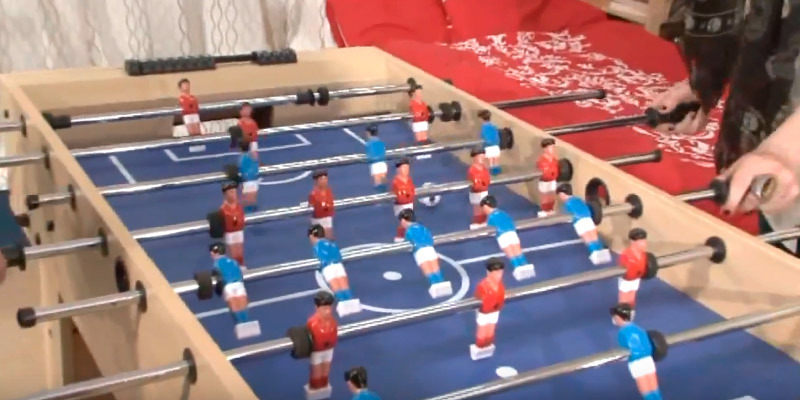 The table Top Football by Wiki is a mini copy of a real playing field with a gate. There are two teams of players on the field. All the nuances are well-thought-out for the convenience of use. There are special deepenings for goals scored and goal counters. 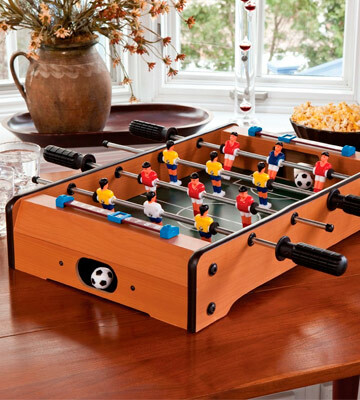 With this tabletop foosball table, you and your child will understand the essence of table soccer game. The Wiki model features excellent gaming characteristics: simple ball control is available even for beginners, and the stick-pass and brush-pass are incredibly easy to get used to. This toy will train a kid to control his or her body, identify its space position, and move with the right speed. In order to cope with the child`s overactivity and develop his logical thinking, parents never hesitate to purchase these kinds of games. Even though parents mostly buy these as a gift for their children, don't get too surprised if you find yourself playing it more than your little one. The table Top Football by Wiki is a dynamic, exciting, and addictive board game that improves reaction and coordination of movements. In just a few seconds, it will create a pleasant atmosphere in your house. Having such a game table at home, you will always have an opportunity to play and have fun. Also, this small table can bring an opportunity to relax in some of the smaller offices. Lots of people dream about having designated rooms for entertainment and recreation at their homes. Nowadays, foosball tables are an excellent and affordable piece of playing equipment for active fun and thrill at your own home and at the convenient time for you. They offer not only a splendid way for grownups to play the stress away after strenuous days, but also a great opportunity for children to improve their reaction speed, coordination skills, agility, brain's activity, and concentration during amusing and enthralling foosball battles. 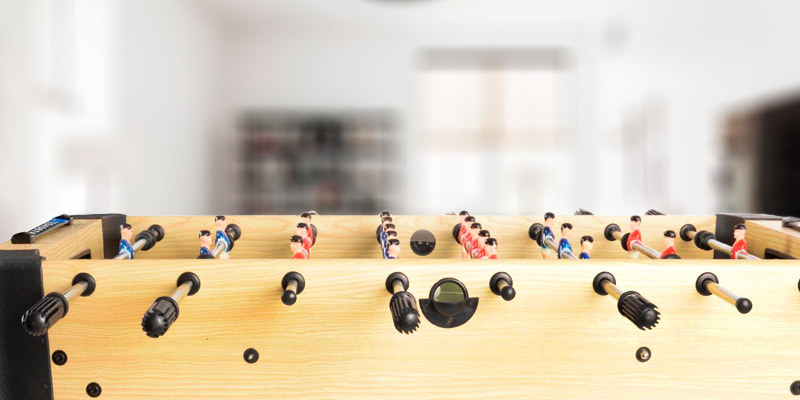 Therefore, we have selected the five best foosball tables for heated competitions and fun family gatherings so that you could easily choose the one that best fits your preference. In addition, we suggest you have a look at our review of the best table tennis tables and furnish your room with another piece of great playing equipment. 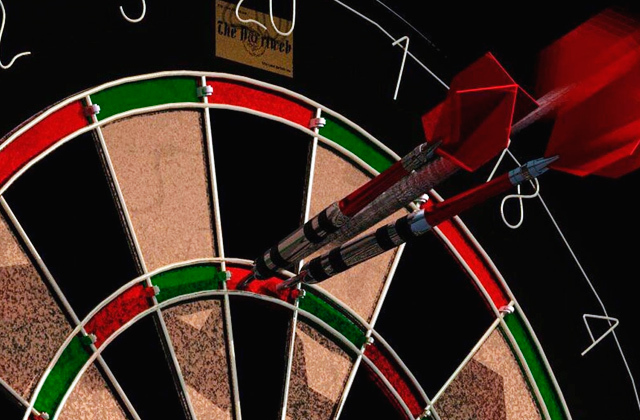 Additionally, you can pick one of the dartboards to try your luck in darts as well as train your accuracy and precision in the comfort of your own home. So, go ahead and find the very best option to meet your personal needs and requirements. Size and weight are the top-priority parameters when choosing a soccer table. Pick the table that will fit into your room perfectly. Also, keep in mind that tables come in folding, tabletop, and standalone models, so go for the model that would perfectly fit your room's interior. When it comes to the weight, the heavier your table is, the better. That's because weighty tables are less likely to be displaced during the intense battles. 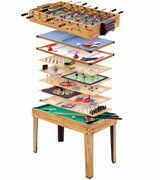 The playing field is also important when selecting the foosball table as it influences the whole playing process. The field should be large and spacious enough for a comfortable playing as well as level and smooth. Table fields are usually crafted from melamine-coated plywood, plastic, or tempered glass. Materials featured in a football table are the next vital factor to consider when making your choice. Most manufacturers usually employ several popular types of materials for their tables. Commonly, these are MDF panels, chipboards, or plywood sheets coated with laminate, melamine, or veneer. The table construction has to be sturdy and properly assembled. 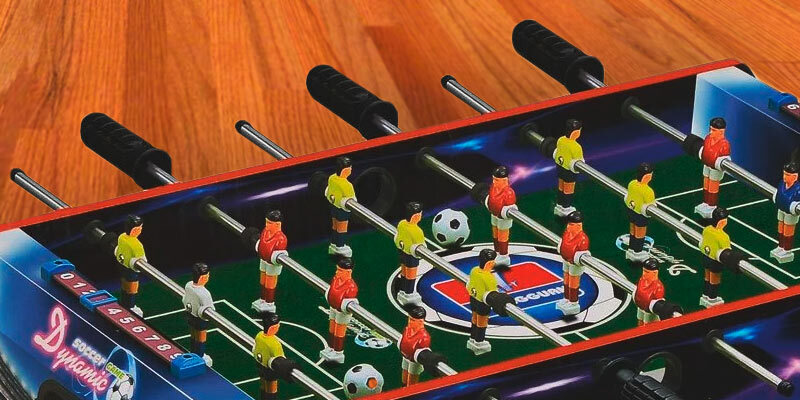 The foosball table rods usually come as the slim tubes that accommodate miniature figures, also known as the players. 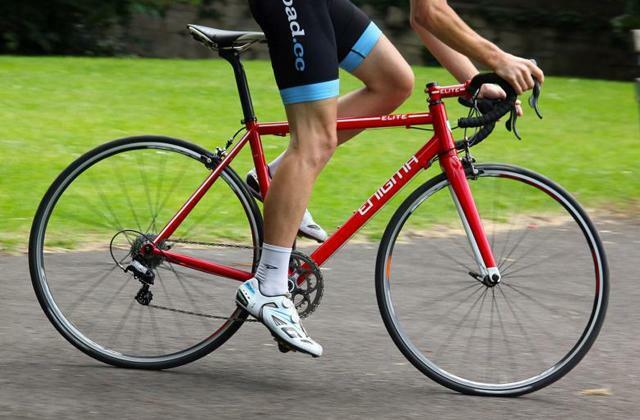 The rods are usually cast in steel and their reliability is vital as they are the key playing elements. The rods come in either hollow or solid design and are fixated in plastic bushes or bearings. The ends of the rods are generally equipped with the handles made of wood, plastic, or rubber. In addition, each rod is fitted with a shock absorber placed between a player and a table board. 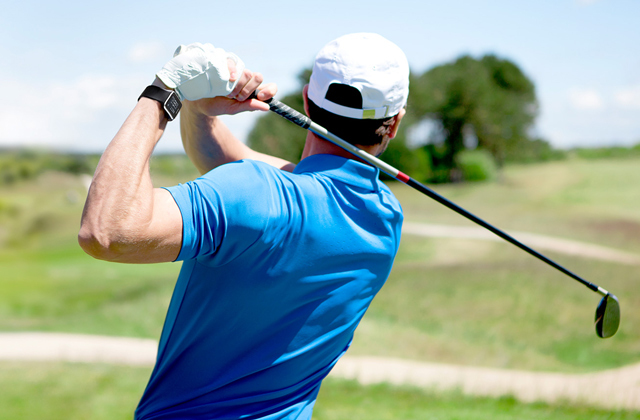 This element dampens the hits and strokes, allowing to keep the players safe. Finally, pay attention to the table players, mainly their aesthetic appearance. Some soccer fans might want to consider the shape and colour of players to suit their needs. Speaking about a ball, it is a replaceable accessory since it can easily fly off the table and get lost, or get scratched, cracked, or damaged (for instance, if you step on it). Hence, foosball balls are available in a range of sizes and colours and it's nice if you purchase a set of balls to have at hand whenever needed. 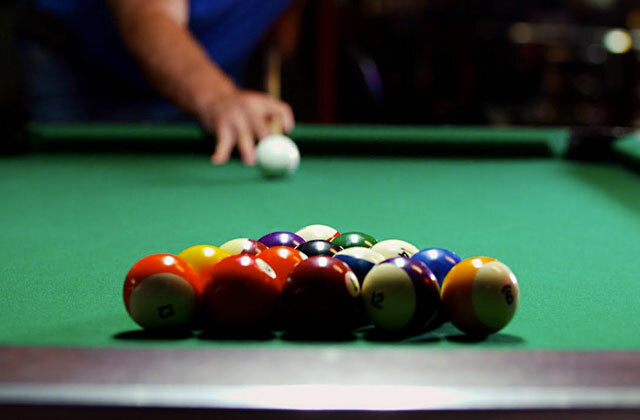 As for the ball return, it's better to get a table with a side return where the ball travels towards the table sides after each successful strike, thus you won't have to waste the time looking for the ball to resume playing. Meanwhile, if you opt for a table with end ball return, you'll get the ball delivered to the table ends after scoring. Q: How to play foosball and what are the rules? A: The objective in Foosball is to score the ball in your opponent’s gates and to keep it away from yours. Each playing side has 4 rods equipped with 13 player or figures and can have control over the field by sliding and spinning the rods. The play goes on until 5 points or 5 goals, thus you can play 2 out of 3, or 3 out of 5 games. The side which won more games wins the match. The game can be played either 1 vs 1 or 2 vs 2 gamers. When played 2 vs 2, one team member takes the defensive rods, while another one takes the offensive rods. To start the game, the ball is either dropped in the table centre from above or served through the "serving" hole, depending on the table design. After the initial kick-off, the team conceded the last score will kick off to resume playing. Before you kick off, ask your opponent if he or she is ready. 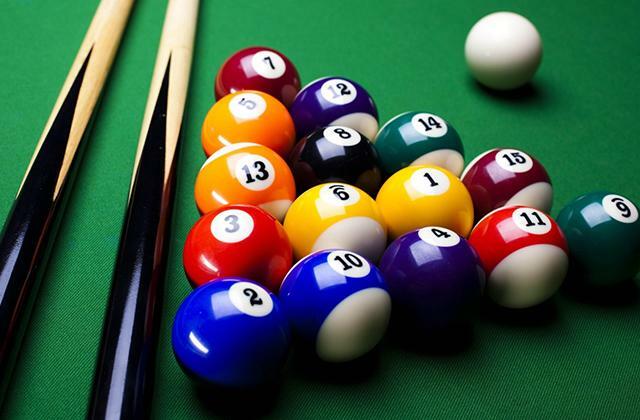 If the ball leaves the table or stops out of reach of players on either side, it is viewed as a dead ball. All the shots going into the gates are counted, even when the ball goes beyond the playing field after scoring. It's not allowed to spin the rods 360 degrees, move the table, and bump the ball against the sidewalls. Also, you won't distract your opponent and any unsporting behaviour or language is forbidden. Q: How to install a table? A: It's wrong to just put your table on the floor, you also need to level it to keep the ball from rolling towards one side and ensure a fair game. So, follow the steps below. 1. Get plastic, wooden or cardboard blocks which will serve as spacers for the table legs. Spacers may be optional if your table already comes with height-adjustable legs. 2. Make sure your table is on a hard and steady surface. If the table is fitted with adjustable legs, check that they are tightly screwed in place and ensure that all of them are even and none is higher or lower. 3. Put a carpenter’s level on both table sides. If the table is sloped, the level's bubble will move toward the higher end of the table. 4. Before adjusting the table, check if the playing field is level both vertically and horizontally with a torpedo level. 5. Once you know the side of the table the bubble travels to, raise this side a bit. Lift the opposite side as well to move the bubble into the centre of the level. 6. Ask another person to lift the table so you can set the legs or put spacers underneath the leg that needs adjustment. Do the same for the rest of legs to ensure the bubble is in the middle regardless of the direction the level is placed. Q: Are there any safety precautions for using a soccer table? A: Yep, there are. In many instances, the rods on a foosball table present the biggest safety concern as you can get your fingers or hands pinched if you get too close to the table holes. As the rods slide in and out of the holes, it’s pretty easy to get your skin accidentally jammed. If you’ve got kids, make sure that your table has some protective covering around the holes, so that your kids cannot stick their fingers in or get them stuck. The rods can also be dangerous if you get too close to the back end. When you play foosball, you’re constantly moving the rods in and out to rearrange your players and endeavour to kick the ball. Despite the fact that tables usually have bumpers on the rods' ends to protect you a bit, the rods are still moving in and out. Hence, if your little kids stand too close, the rod's ends might hit them in the stomach or even punch them in the face, depending on your kids' height. Also, you definitely need a table with rods that have caps, since exposed metal can scratch and make the accidental hits much more dangerous and severe. Q: How to maintain a table? A: Get a dry cloth (soft and free from chemicals) and wipe every element of your table, including the rod handles and players. Consider the legs and even the table bottom as you never know how far the dust can settle. Then, take a clean cloth and apply some rubbing alcohol onto it, then carefully wipe the table surface like you did with the dry cloth. The detergent will both clean and sanitize your table from top to bottom. So, make sure you are thorough and get in all the hard-to-reach places. 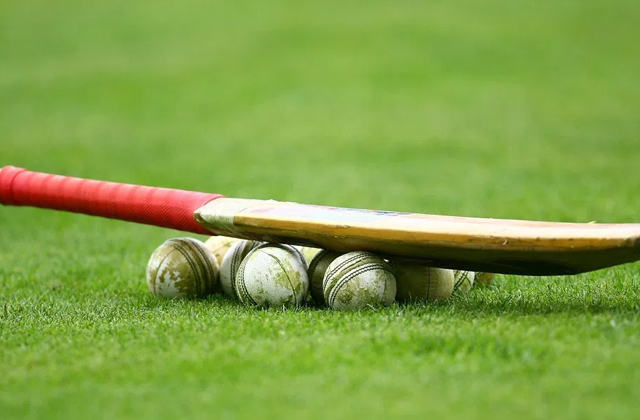 If players have black marks from the ball, rub them as hard as it takes to get the marks off, but be careful not to harm the rods or players. Lastly, apply Foosball silicone on the rods to make a sleek (but not slippery) finish and ensure a smooth and well-going play. If Foosball balls look shabby, clean them with the rubbing alcohol as thoroughly as you can. 1. 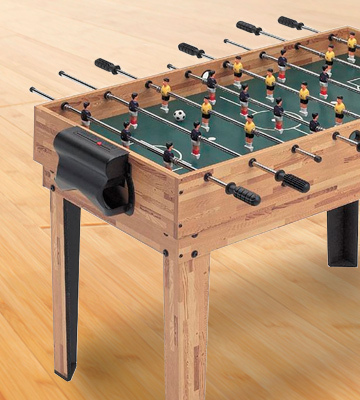 Foosball Table Buying Guide, eBay. March 3, 2016. 2. What to Consider When Choosing a Foosball Table, Best Buy. December 1, 2014. 3. Irma Wallace 10 Point Foosball Table Buying Guide, InfographicJournal. August 5, 2016. 4. 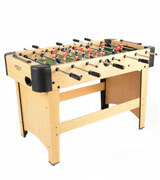 FAQs about Foosball Tables, Overstock. 5. Table football, Wikipedia. March 20, 2017. 6. 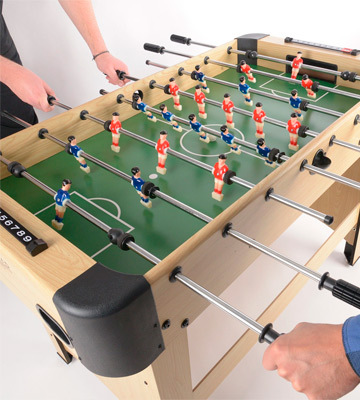 Jake Wilson The Ultimate Buying Guide for the Perfect Foosball Table, EzineArticles. October 04, 2016. 7. Mile Berry Finding a Best Quality Foosball Table, Abilogic. April 21, 2015.